Contrary to popular belief, Britain may not be a nation of dumbed-down MP3-toting philistines who prefer computer games to the mind-expanding delights of a good book. Instead, according to the latest research, people in the UK are reading more than they did a quarter of a century ago. A team at the University of Manchester has found that, while Britons spent just three minutes a day on average reading a book in 1975, by 2000 this rose to seven minutes. 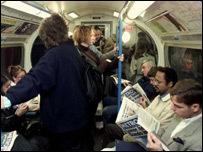 And when magazines and newspapers were taken into account, Britons were reading five minutes more every day in 2000, compared to their 1970s counterparts. Women in particular increased their page-turning time. The new findings fly in the face of many people's assumptions about modern Britain. Victoria Beckham, often quoted as telling a Spanish journalist she had never finished reading a book, has been held up by many as representative of a new breed of literature phobes. Research by the Office for National Statistics, commissioned by the National Reading Campaign in 2001, seemed to back up the idea. It found a quarter of adults had not read a book in the previous 12 months. But the latest study suggests Britain is not as literature-unfriendly as many first thought. 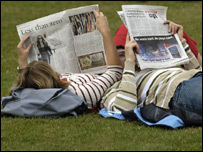 According to Dr Dale Southerton, a member of the University of Manchester research team, people now have more time for books. And the increase in reading can be explained by the changes in how people organise their lives and better access to education, he says. In seems that increased time spent commuting and waiting for friends is seen by modern Britons as a good time to catch up on a few chapters. "If your day is more fragmented, you are more likely to have gaps, and reading is a particularly useful way of filling in the gaps," Mr Southerton says. "Also, reading is not reliant on others to participate." He also suggests better access to universities has also influenced reading habits. "There are so many myths about these eras, such as that we have dumbed down. But more of us are better educated now and are likely to enjoy reading," he adds. In fact, according to a study by the Museums, Libraries and Archives Council earlier this year, people are even bothered about being seen to be reading the right kind of book. A third of those asked chose "challenging literature" in order to seem well-read. Top of the list was JRR Tolkien's Lord of the Rings, Leo Tolstoy's War and Peace and Emily Bronte's Wuthering Heights. Julia Strong, director of the National Literacy Trust, agrees that Britons are reading and writing more than ever before. And, she suggests, if figures for reading online were taken into account after the year 2000, reading statistics would increase further. "One of the really big changes is the internet," she says. "People may be reading newspapers less, but they are reading them on the internet more." Another big factor in recent years has been the coming of the "freebie" paper. "I was on the tube the other day and everybody was reading one," Ms Strong said. "Compare this to when I was in Bangkok - I didn't see anyone reading." People's choice of reading matter has not changed significantly, according to Ms Strong, with people still enjoying the same "rattling good reads", such as thrillers and suspense novels. But the way people read and write to communicate with each other has been revolutionised. "If we are talking about reading for pleasure, people now read on the internet, people read text messages and emails," she says. "If reading is deciphering symbols, that is all reading. "This has also changed the nature of writing. Nobody is writing letters, but people are writing more than they ever did and taking part in written communication." Rising literacy standards since the 1990s have helped with the appreciation of books, she explains. But she says modern Britain faces the challenge of an excluded minority which has little experience of books. "All evidence shows that parents who encourage their children to read and are readers themselves, have children who become readers too and this will open all the doors that reading can open," says Ms Strong. Debbie Hicks, director of research and strategy at the Reading Agency, a charity which aims to inspire people to read, says electronic media and traditional forms of reading should both be encouraged. But paper pages will not disappear, she adds. "Young people are seen to be reading less and playing more computer games - but they are also reading to play these games and creating a narrative of their own. "But the book will always be there and it is an important part of a lot of people's lives. It is a very important way of engaging with the arts and creativity as well as a way of gaining knowledge."